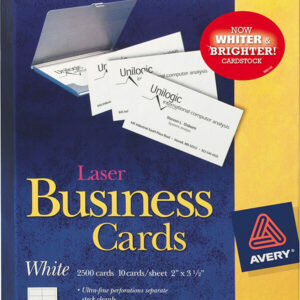 The white premium business cards C32016-25 Avery in the format 85×54 mm ensure excellent print quality through the satin and ultra white surface specifically for laser printers. 250 business cards on 25 sheets. The dual-sided business card, with a grammage of 220 g / m², has thanks to the patented Quick & Clean ™ technology perfectly smooth edges. On the back of the business card for additional information such as opening times, Directions or services space. Environmentally friendly, FSC certified, bleached without chlorine. 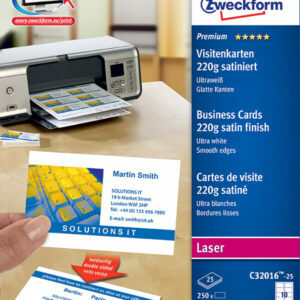 Design and print your business cards quickly and easily – with the free Avery templates and software solutions Avery®Design & Print Online under www.avery-zweckform.eu/print. 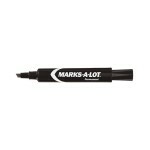 Suitable for all standard laser printers. 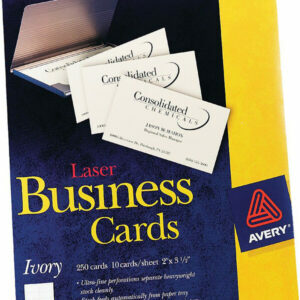 Make the right impression every time with customizable Laser Business Cards. It’s easy to create these do-it-yourself business cards, too. 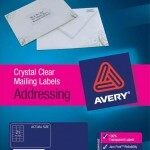 Start with the free blank and pre-designed templates from avery.com, then customize your card with your own personal touch. 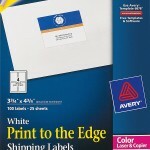 The heavyweight card stock prints easily from all laser printers and separates cleanly thanks to ultrafine perforations. You’ll get professional-looking business cards that look like they came from a print shop. What will your business card say about you? 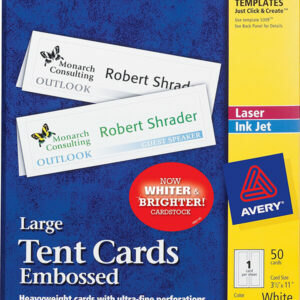 Add a personal touch to parties, events, meetings and celebrations with custom-printed place cards you can print at home. 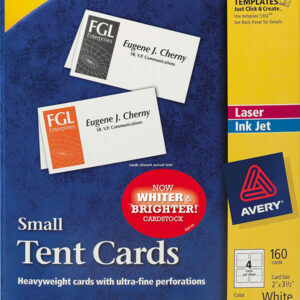 These Large Embossed Tent Cards feature premium, heavyweight cardstock that stands up to frequent folding, making them perfect for use as place cards, on buffets, or as product description cards at boutiques, trade shows or farmers markets. 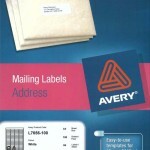 Personalize and print with our free designs and templates at avery.com/print. Bright vibrant colors and sharp, clear text can be printed to the edge on both sides for a polished, professional look that will add a special feel to any event. Want to make a big impression? 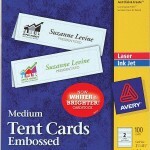 These Small Tent Cards are ideal for trade shows, conferences, buffets, meetings and more. The heavyweight cards keep your all your information upright for everyone to see. Use our free printable designs and templates to create your own personalized cards. You’ve helped your company grow, now make it thrive. 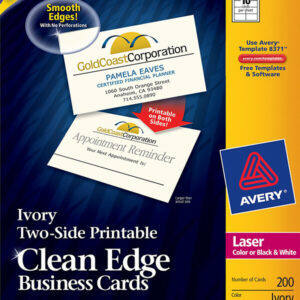 Use these Two-Side Printable Clean Edge® Business Cards to get the attention your growing business needs. 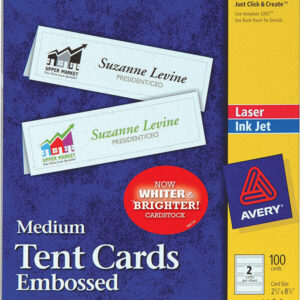 Print rich graphics and clean text on both sides to expand exposure to your goods and services. 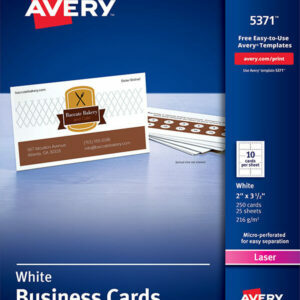 Free templates from avery.com get you started in a snap. 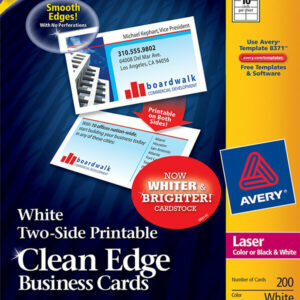 Sturdy cards with clean, smooth edges can go from your laser printer to a potential customer’s hand in minutes. It’s so easy, you’ll quickly take your business above and beyond.